Body Mass Index (BMI) is a way of measuring and comparing a child's (or adult's) weight to determine whether it falls within a healthy range. BMI charts are often utilised in keeping statistics on underweight overweight, obese, and healthy weights for individuals, prompting action by the health care community when, as is the case today, a growing percentage of the population measures outside of ideal ranges for optimal health and well being. Calculating BMI is a simple procedure. Weight in kilograms (kg) is divided by height in metres squared (BMI=kg/m²). The result of this basic calculation can help to determine the overall weight status, but it's important to note that in children, the results can be a bit deceiving. Normal development in children doesn't follow a steady or even path. In fact, most kids have many uneven growth spurts, sprouting up in height while their weight remains the same one year and then gaining weight without adding a bit of height the next. Fluctuations in BMI are perfectly normal for kids, but when a child's health practitioner notices an ongoing trend toward either underweight or overweight, it may be suggested that parents intervene to help their kids to achieve and maintain a healthy weight. Again, it is important to remember that BMI numbers are only one way of looking at weight. There are factors that can change the determination of whether or not a person's weight is healthy, even if their BMI number says otherwise. For instance, muscle is heavier than fat, so a teen who has worked out in order to build muscle mass may step on a scale to see a number that has actually increased since embarking on a fitness plan. In this case, the additional weight is healthy, so equating that teen with another of the same height and weight who has added weight by making poor dietary choices would provide an inaccurate comparison. For this reason, utilising BMI along with other considerations is vital in order to get a complete and accurate picture of health and fitness levels. 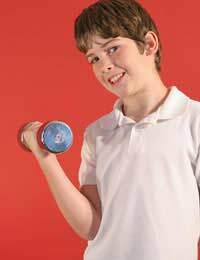 For instance, in the above example of the two teens of identical height and weight, taking waist measurements would reveal the truth -- the kid who has been working out would have a smaller waist since while muscle is heavier than fat, firm, lean muscles are smaller than the same weight in fat tissue. Overweight and obesity have become commonplace amongst the general population, children included. Childhood obesity is at an all time high, putting kids at risk for futures riddled with an assortment of ills, including hypertension (high blood pressure), heart disease, diabetes, and certain forms of cancer. No parent wants to see their children become sick, so healthy eating and activity must be incorporated into the lives of kids, one household at a time.